This cover was for the special "Silver Age" mini-event in 2000. I saved this image of the cover, sans the logo and captions, from one of the DC solicitations. Kevin Nowlan inked this cover and many other jobs that Kane worked on during this period. 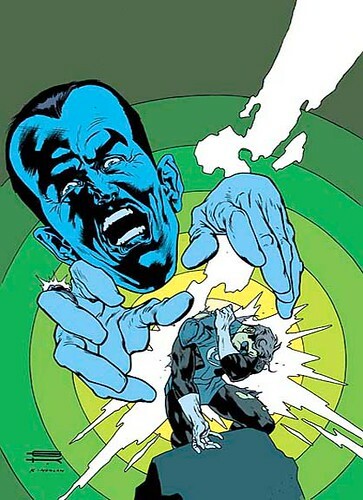 I really like the color scheme in this version--Sinestro in a blue haze raining down trouble on Hal Jordan, which the green circles focus your attention on. Apparently someone at DC Comics did not like that color scheme. Here's the actual published cover. Perhaps the editorial change was to restore Sinestro's purplish skin color as it appears in the interiors. 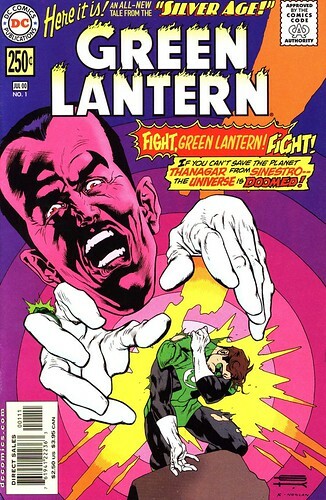 However, they made a mistake with this new color scheme--Sinestro's ring is emitting green energy, not yellow! Nuff said.